Hawaii's homeless population is starting to show up on the radar of the visitor industry. If left unchecked, the problem has the potential to hurt the $11 billion business, officials say. 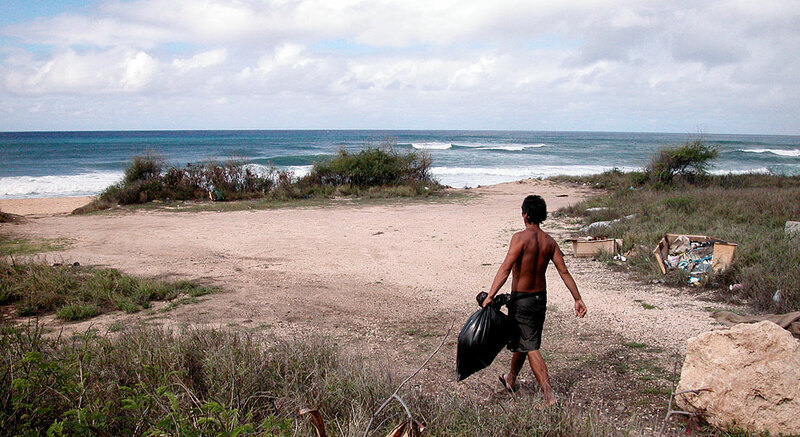 The negative byproducts of Hawaii's pricey paradise -- hungry people, panhandlers and garbage on the beaches -- aren't the stuff of visitor dreams. "Homelessness hasn't made an impact on tourism to date; however, there are concerns that as we move forward, it could affect tourism," said state tourism liaison Marsha Wienert. Rick Egged, who has worked with the Waikiki Improvement Association for the past eight years, said Waikiki visitors began making their first complaints about homelessness in 2006. "I get about one or two complaints a month," Egged said. "That's not substantial but I didn't get any before." Visitors most frequently complain that homeless people have shouted obscenities at them or that they have left rubbish on Hawaii's beaches, Egged said. "Compared to other cities that I've been to, I'd say that we have a relatively small problem," Egged said. "Homelessness has had little effect on the visitor industry, but from a human standpoint we are concerned about any increase in homelessness." Still, many Waikiki residents and businesses are monitoring the homeless, Egged said. The Waikiki Business Improvement District Association, made up of property owners and tenants, recently commissioned a study on homelessness from the University of Hawaii's Carl Kim, he said. The study, presented last month to nearby neighborhood boards and to the improvement association, found that 248 homeless people were living at Waikiki Beach, Kapiolani Park and Ala Moana Beach Park, Egged said. "It's a shame," Egged said, adding that among Waikiki's homeless are those suffering from addictions and mental illness. "The difficulty is that we've lost a lot of these folks," Egged said. "These are not the same homeless as those folks who are living on the beaches in Waianae that are there due to economics." As a result of the study, the improvement association and other Waikiki-based groups have resolved to link Waikiki homeless with appropriate resources, he said. "This is a human and a societal problem," Egged said. "We don't have the resources to deal with it, but maybe we can facilitate contact between the homeless and the service providers who can help them." While Hawaii hotels have not complained about homelessness to the Hawaii Hotel Association, the organization's president, Murray Towill, said many are taking steps to ensure that their employees have access to affordable housing. "There are many public-private partnerships within the hotel industry to make affordable housing available and to provide assistance for their employees and future," Towill said. "We all want to avert homelessness." Hawaii's high home prices and tight labor market have prompted employers to begin offering housing-related perks as part of their benefits packages, said Kendall Hirai, executive director of the Hawaii HomeOwnership Center. Hospitality companies like Marriott and Ko Olina Resort & Marina are among a group of employers who have begun offering housing education programs, Hirai said. During the past year, living wages and affordable health care were top contract issues for hotel union Unite Here Local 5, said spokesman Cade Watanabe. "Many of our members live paycheck to paycheck," Watanabe said. "They need a living wage to be able to afford the rising cost of housing." There are a number of state and county initiatives designed to cut the rate of homelessness, and all will improve the state's tourism industry, Wienert said. "The more that we can do to assist our residents, especially those that are finding themselves without a home, the better off our industry will be," she said. "If you have a happy community, you will have a happier visitor industry." For the second time in as many months, a national publication is calling attention to the plight of the homeless in Hawaii. A story in today's editions of the Wall Street Journal describes the burgeoning homeless population in the state and some of the efforts that have been undertaken to combat the problem. It comes about a month after the New York Times ran a similar story. "I don't think any community anywhere in the country wants to have publicity like this," Gov. Linda Lingle said yesterday. "Do I think it would stop one person from visiting? No, I don't, but that doesn't mean it's not an important issue to me anyway. "How it affects a visitor coming here or not, there are a lot of other people who worry about that aspect of it. I worry about these (homeless) people." Lingle noted that her proposed budget for the upcoming fiscal biennium is heavy on spending for social services, including $128 million for affordable-housing projects, transitional housing and emergency shelters. Lingle said she had not seen the article yesterday, but she was aware that it was in the works. "Yes, I wish there was never an article like this, but no, I don't think it'll keep visitors from coming here," she said. "I think it'll give readers a view of Hawaii that we wish they didn't have and that I wish wasn't the reality." City spokesman Bill Brennan said the article validates the city's position that the responsibility to tackle homelessness lies with the state and that the city will work to complement the state. "Both the problem of homelessness and the solution to the homeless situation lies at the doorstep of the state," he said. "The mayor said a year ago, the city will and continues to work to complement the work of the state." The state has the proper resources making it the proper level to address the issues, with departments for human resources, housing and mental health, which the city does not have. Star-Bulletin reporter Robert Shikina contributed to this report. » Homelessness: Picture of paradise?